The solutions to Quiz 3 can be found here. 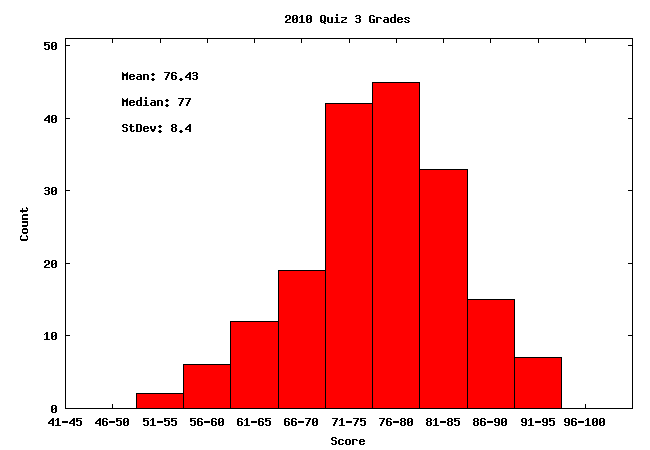 The grade distribution for Quiz 3 is displayed below. Have a good summer! If you're interested in computer security, you might consider taking 6.858 next fall. There will be a Quiz 3 review session on Tue, May 18, from 7:00-9:00 PM, in 10-250. There is no class this coming Monday, May 3. We suggest you work on your DP2 instead! Please note that revisions are *not allowed* for DP2! Our policy about DP1 revisions was ambiguous. The policy is that we will accept revisions for the technical portion of DP1 reports that received a (technical) score of less than 90 (revisions of the writing portion of your DP1 should still be coordinated with your writing instructor.) The maximum revised score you can receive is 90 points. Please talk to your recitation instructor this week if you wish to revise; revisions are due Friday May 7. Your revision should take the form of a complete report with the changes clearly marked (e.g., with change bars or highlighting), unless your recitation instructor specifies otherwise. Instead of tutorial on Friday, Apr. 30, the TAs will be holding office hours to go over any questions you might have about DP2. The DP2 proposals should be handed back to you by Thursday. The office hours will be held from 1-3, in 15-minute slots. Contact your TA for a slot. It is best if your entire team can make it to the scheduled time. The solutions to Quiz 2 can be found here. The DP2 group assignments are now up. Contact the staff if you have not been assigned a group, or if you have been assigned agroup and intend to drop the course. Quiz 2 will take place this Friday, Apr. 16 at 2 PM, in the Walker Gym (50-340). The test will be open laptop, no internet, and open notes as before. Quiz 2 review session will be in 4-370 from 7:30-9:30 PM this Wednesday, April 14th. Because lectures 9--14 were substantially different from those given in previous years, we've posted lecture notes for this year. Notes from previous years are still available here. You can find Q2 from 2006-2009 here. The criteria for the writing part of your DP1 grade are described here. We will accept DP1s late, but we will cap your grade 15 points lower (out of 100) for each recitation it is late. So, if you turn in your DP1 after the due date, but before the 1st recitation after spring break (March 30), your maximum grade will be an 85. If you turn in your DP1 the 2nd recitation after spring break, your maximum grade will be a 70, etc. The looking-glass.optus.net.au server does not always complete a request for a traceroute. If you get no reply after 2--3 minutes, you should try one of the other looking glass servers on this page: http://www.traceroute.org/#Looking%20Glass For example, we have had success using the "Qwest USA" server (2nd from top). If you do this, you should run your local traceroute to whatever server Qwest tells you it is running traceroute from for this question, and make sure that you note in your hands-on that you used a different server than the question asked for. The writing program setting up extra time for the students for next week: Mary Caulfield will have office hours dedicated to addressing questions on this assignment, on Monday 15 March, 10AM-11AM and on Wednesday 17 March, from 3PM-6PM in 12-113; she will also run a makeup session on Monday 15 March, 5PM-6PM in 12-134. Don Unger will run a makeup session dedicated to addressing questions on this assignment, on Monday 15 March, 11-12, in 12-134. The solutions to Quiz 1 can be found here. 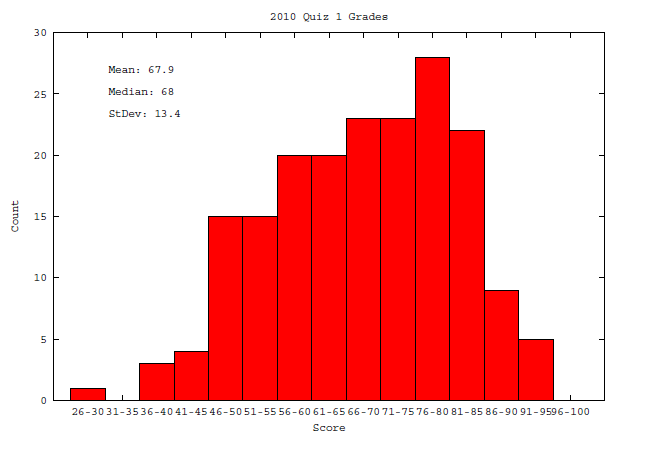 The grade distribution for Quiz 1 is displayed below. You can find a selection of past 6.033 quiz questions in the textbook. You can find old quizzes with solutions here. The TAs will be holding a review session on Wednesday from 7:30pm to 9:30pm in 54-100. The writing program lecturers have prepared a list of Do's and Dont's for writing proposals. You can find the guide here. There will be a make-up/supplemental writing tutorial on Monday at 5:00 in 12-134. This is open to all 6.033 students. Mary will go over specifications for writing the proposal that is due on Tuesday. If you missed Friday's tutorial, or if you want a more complete discussion of the DP1 proposal, please stop by. Contact Mary Caulfield (mcaulf@mit.edu) if you intend to go but can't be there right at 5. Donald Unger will have extra office hours Monday 11-1, in 12-112 to answer questions about the DP1 Proposal and meet with the students in his section regarding the Therac memos. You'll get back Memo #1 with the grade/comments on Thursday. This is to make sure that everyone will have comments in time for the DP1 proposal. The rooms for the writing tutorials have changed. Please go to the recitations page to see the changes and go to the appropriate room on Friday's tutorial. You can now submit, as a PDF, your File System Hands-On assignment at the course submissions page. Design project 1 is posted. You are to submit the Therac-25 memo at the course submissions page by 5pm tomorrow. This assignment must be submitted as a PDF. No other formats will be accepted. Tomorrow the writing program will be holding recitations. Please attend one of the two recitations for your recitation instructor, at either 1PM or 2PM. Rooms for the recitations are posted on the recitations page. The recitation assignments for the course are now up. Please attend the recitation you've been assigned. If your name isn't on the recitations list, contact the staff so you may be assigned a recitation. A link to a recent New York Times article related to your Therac-25 assignment has been added as well. It can be found on the assignments page. Please drop by CopyTech (11-004) and buy the 6.033 course packet for $18. The packet contains the 22 papers you'll be reading for recitations. 6.033 begins on Tuesday Feb 2 with a recitation. You should ignore the recitation room and time assigned to you by the registrar. Note that not all of the recitation rooms listed by the registrar will be offered, but all timeslots will be available. Please consult this list of available recitations and go to one of them on Tuesday, February 2 (the first day of classes). During recitation, you will be given recitation preference sheets on which you can list your recitation and tutorial preferences. By 10pm on Wednesday February 3, we will assign a binding list of recitation assignments for the rest of the term, and post them to this page. 6.033 will be using Saltzer and Kaashoek's Principles of Computer System Design: An Introduction (Morgan Kaufmann 2009); the readings are required. You can get a copy at the MIT Coop.